While some of these bikes can’t be classified as ‘motorcycle touring’, I’ve decide to include the list of bikes I have had over the years… The first bike I ever rode was my father’s BSA 125 Bantam. Guess this was the beginning of my love of riding. In the hot desert country of Western Australia’s outback the carbie would vaporise leaving you stranded miles from anywhere. I remember a trip out to the ‘turn-off’ to collect the mail where the beast died and simply would not re-start, and I walked the 35 kilometres home. The annoying thing was that on taking out the ute the next day to pick it up, it started first kick! The Kawasaki 500 Triple was my first road bike, and I rode thousands of kilometres on gravel roads, a feat appreciated by those who know what a dog of a bike these were! It would wheel stand in third gear and was far too light for the power developed, especially on gravel roads. I hit a kangaroo at 130kms on a gravel road coming back from a night out East of Leonora which pretty totalled the bike. Yep and I survived. By the time I was in my twenties I really had the motorcycle touring bug. This Yamaha SR500 did a mighty job, two up from Launceston in Tasmania across the Nullabor to Perth, without missing a beat. Whilst my wife flew back, (found out she was pregnant with twins) I rode the return trip solo. An inexpensive way to travel combined with camping wherever we felt like, it was the greatest sense of freedom and a wonderful trip. 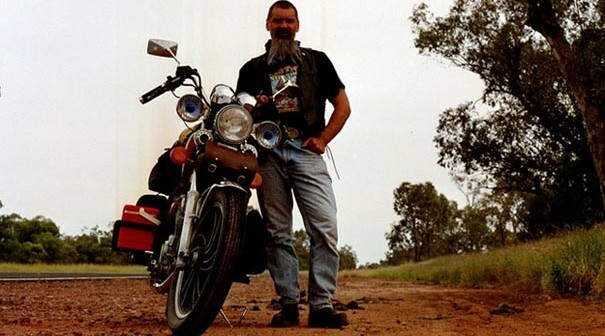 The Honda was a good solid workhorse, not only providing transport when shearing in Victoria, but allowed me to do some great motorcycle touring and camping trips around the Victorian coast. I made up a frame to carry a Woolpak on either side of the bike where I carried anything up to 100Kgs of wool back to inner city Melbourne. Looking from behind I imagine it was a pretty bizarre sight for the Melbourne folk. I know the chap I was living with at that time was keen to see me leave as his courtyard was always covered in drying fleeces and piles of dags. The old Yamaha 750 shaft drive was my favourite. This was a comfortable bike to ride, even on the silly occasions where I rode 900Kms in a day. That is why I look so happy below… after 13hrs of riding it was a joy to find a roadside stop where I could lie down. This parking bay near Longreach in NSW even had a cyclone bed for me to roll my swag out… it dosen’t get much better than that. The Yammy and I toured and camped extensively through Tasmania, Victoria, NSW and Queensland. The Kawasaki VN 1500 was my last bike, and riding from Brisbane to Uluru in the Northern Territory completed my long held dream to ride and camp in every state in Australia. Due to back issues motorcycle touring is no longer an option, and so I cherish these memories from over 40 years of riding.